Choosing tile for your home renovation project may not seem like a difficult task – until you discover how many types are available. Tile is a relatively low-maintenance alternative to other floor and wall materials, cost-effective considering the life span if correctly installed and well-maintained, and the selection is staggering. Whether you’re looking for classic or modern, indoor or outdoor, or even something that looks like a totally different material altogether (such as wood), you can find a tile to suit your needs. If you’re considering tile, you should know what your choices are. This guide includes info on common tile materials, their uses, and how to keep tile looking brand new, so you can choose the right tile for your home renovation project. Generally accepted as the most durable of tiles, porcelain is a classic material used in looks that have been around for more than 100 years. Porcelain floor and wall tiles are pressed and fired at very high temperatures to make them more impervious to water, so you can use them indoors or outdoors. Porcelain is available in glazed or unglazed finishes, and each choice has its advantages: glazed tile is often quite hardy on its own, and more versatile for home décor with more colors and patterns. Unglazed porcelain tile is more slip and scratch resistant, and chips may not be as visible; unglazed tiles are often through-body porcelain, meaning that the color is consistent throughout the piece. TIP: Clean porcelain tiles by sweeping or vacuuming, or use soap and water for a more thorough cleaning. This is also an extremely versatile product, though it does have a water absorption factor (even when it’s glazed). For this reason, ceramic tile is only recommended for indoor use, as it could absorb water and crack if the temperature drops and the tile freezes. Like its porcelain counterpart, ceramic tile comes in glazed and unglazed varieties, and it’s a master of disguise. Since glazing methods and digital print technology in the tile industry have advanced dramatically, it’s now easy to get an elegant and aged look without the hassle of installing brand new tile and waiting approximately 150 years. Easy maintenance through sweeping, vacuuming, or soap and water keeps ceramic tile looking its best. TIP: Use Our Real-Time Remodeling Calculator and Find Out in Minutes How Much Your Home Renovation Project Will Cost. Metal tiles – usually sold in mosaic form – are a fun, daring, and unique way to dress up any space. Typically comprised of a porcelain or ceramic tile capped with a layer of metal (the most common is stainless steel), these tiles are often used as an accent to larger installations or on their own as backsplashes. Because of the metallic sheen and the poor scratch and slip resistance, metal tiles are used almost exclusively on walls. The range of metal tiles in terms of materials and color is impressive, and the specific care instructions tend to vary based on the material. However, there are some basic steps to caring for all metal tile: clean it only with a soft cloth, scouring pads or abrasive cleansers will scratch the finish. Secondly, soapy water will usually do the trick to keep these tiles clean, no specialized metal cleaners needed. However, since every manufacturer and material is different, you should check just to be sure. After putting up a creative and sparkling tile installation, the last thing you need is to compromise its beauty by using the wrong cleaning technique. Glass mosaics used to be an iffy option for tile in the home: perhaps the look didn’t successfully accompany many décor styles, or there was concern that it may not be long before the look became outdated. Those are reservations of the past. Glass mosaic tiles have been hugely popular for more than a decade now, and you can get them from artisans and big-box stores. Glass mosaics are often sold in mesh-backed sheets for easier installation, and pair well with almost any material. They come in a wide variety of textures, colors, and finishes, making it easy to give any space a little (or a lot) of glam. Some popular materials to be paired with the glass are metal, stone, and cracked glass with stainless steel. Of course, there are glass mosaics that aren’t mixed with any other material. Because glass mosaics aren’t rated for slip resistance or durability, they are not suitable for floor use. The impervious nature of glass, however, makes it great for shower walls or use at the waterline of a pool, when installed correctly. Adding some textural elements and unique color mixes to a backsplash make spatters and dirt a little more difficult to see, so if you can’t get around to cleaning it right away, no one will notice. However, these mosaics require regular upkeep. Cleaning methods vary by material (a mosaic blend or all glass), but the basics remain the same. Don’t use abrasive materials, as this may scratch the surfaces you worked so hard to set. Clean them with a soft cloth or, if you opted for textured glass, a soft brush to get everything out of the crevices in the surface. For those in-between cleanings, all you’ll need is a duster. Few things beat the majesty of natural stone when you’re decorating an interior. However, not all stones are created equal when it comes to tile. If natural stone tile is what you’re after, commonly used materials include slate, marble, travertine, granite, sandstone, and limestone. It’s imperative to consider what purpose the tile will serve. Are you putting it on a high-traffic floor, like your kitchen? Are you using it on a wall? Like porcelain and ceramic, stone tiles need to be considered for their slip resistance, their finish, and their durability. For example, there are some types of marble that are on the softer side and not ideal for floor use because of how easily they scratch. For this reason, it’s essential to check the properties of the material you’re using. 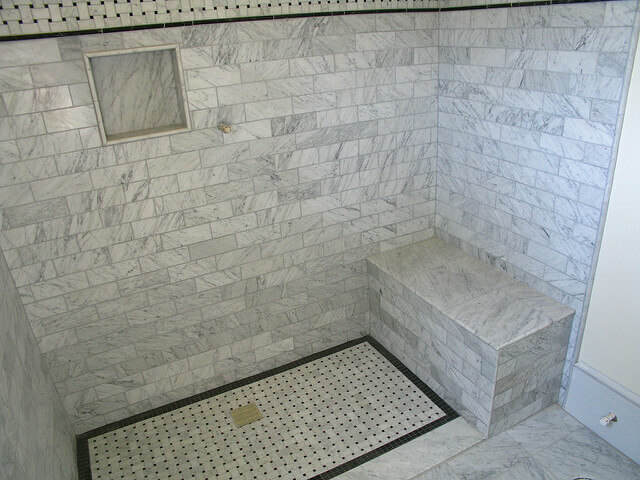 Most natural stone tiles require a sealing agent, and have different cleaning requirements. Whether you’re dreaming of an idyllic European villa or a sleek, modern space, choosing the right tile can help create the atmosphere you seek. From neutral looks to wild pops of color, tile adds character without sacrificing practicality. It is, however, a long lasting commitment – so, like any commitment, explore your options and go with something you love. MORE: 5 Tips to Find the Right Tiling Contractor for Your Project. Maggie McBride is a doer of many things, but prefers writing and photography. She is based in New Jersey and has a background in home decor, communications, and social media. More of her work can be found at maggiejoan.wix.com. My wife loves the look of tile, and we wanted to make sure that we chose the right kind for our bathroom. I really like what you say about the stone! I really do like that they are softer materials, and that they can be very good for counters. I didn’t realize that ceramic tile had a water absorption factor. I definitely want my tile to repel water so it is easier to clean up. My wife and I have been debating which kitchen tile to pick for a while. I will have to make sure and send her this article so she can compare some tiles. My mom really likes the look of glass tile, and has been talking to me about wanting to get some for her home. I’m glad that you talked about how they are often sold in mesh backed sheets to make installation easier. 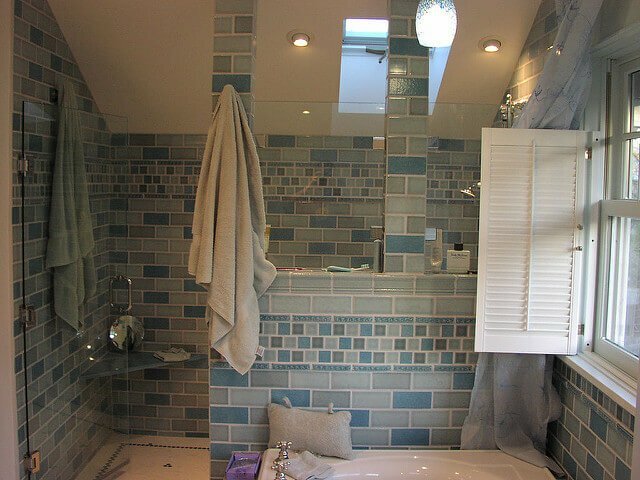 I think that being able to get the right glass tile she wants would be good for us, and if installation is too difficult, we could hire a professional to come get it done for us! Thanks for the info!